Unless otherwise noted, all lectures and book talks are held in the Slave Quarters located at 15 George Street in Medford, Massachusetts. Visit our Directions and Map page for more information. Our home community of Medford, Massachusetts is better known for its 19th-century history of abolitionism than its earlier history of enslavement. This spring, several other local programs and exhibits will explore abolitionist history. 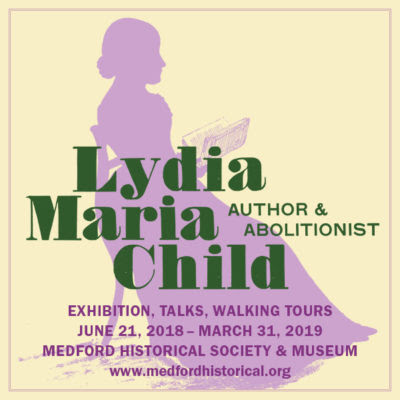 At the Medford Historical Society & Museum, an exhibit entitled Lydia Maria Child: Author and Abolitionist continues through March, expanding the story of this local author beyond her famed “Over the River” poem and exploring how the Medford-born daughter of a baker became one of the most important writers and abolitionists of the 19th century. On the evening of Wednesday, April 3rd, historian Charles E. Heller will discuss his work In Advance of Fate: Portrait of an Abolitionist at the Medford Public Library. His work is a biography of wealthy industrialist and abolitionist George Luther Stearns, whose property is now part of Tufts University’s Medford campus – located just blocks from our museum. Stearns helped finance the settlement of Kansas by antislavery homesteaders, was a member of the “Secret Six” who supported fiery abolitionist John Brown, recruited thousands of black troops for the Union Army, and included his home as a stop on the Underground Railroad. This talk is co-sponsored by the Medford Historical Society & Museum. This marble bust (left) was unveiled at a celebration hosted by George Luther Stearns at his Medford estate on January 1, 1863 – the first day the Emancipation Proclamation went into effect – where Ralph Waldo Emerson recited his Boston Hymn and Julia Ward Howe her Battle Hymn of the Republic. It is displayed in the Tisch Library at Tufts, accompanied by a bust of Stearns that was commissioned from inventor/artist Samuel Morse by widow Mary Stearns, whose will stipulated that both pieces go to the University upon the death of her sons. On Sunday, April 7th, an exhibit on Stearns, Shaw, and the Hallowells will open at the Medford Historical Society & Museum. Featuring items from the museum’s Civil War collection, this exhibit will explore the connections between George Luther Stearns, Robert Gould Shaw, and the Medford Hallowell brothers, Edward and Norwood. Stearns recommended Shaw to lead the famed 54th Regiment Massachusetts Volunteer Infantry in the Civil War. When Shaw was killed at Fort Wagner, Medford’s Edward Hallowell took his place. Edward’s brother Norwood led the 55th Massachusetts regiment. 2018 In Review: Happy New Year! As we look forward to another busy year, we’re pleased to share some highlights of our museum’s activity in 2018. We welcomed a 13% increase in tour visitors over the previous year. We hired a diverse team of professional guides to lead regularly scheduled tours for the first time, and were delighted with positive visitor feedback on the quality of the new tour experience. More than 40 college classes, alumni groups, clubs and service organizations, adult education programs, and other groups arranged for special tours last year. School field trip numbers increased with the addition of several new communities and independent schools last year. In January, Tufts University historian Kendra Field spoke about her family’s fascinating history as told in Growing Up with the Country: Family, Race, and Nation after the Civil War. Art historian Charmaine Nelson used contemporary artwork and descriptions of freedom-seekers from advertisements to explore enslavement in her native Canada for an April program. In May, we welcomed author and quilter Rachel May for a discussion of An American Quilt: Unfolding a Story of Family and Slavery, her illuminating examination of early 19th century slavery through the story of an unfinished quilt. 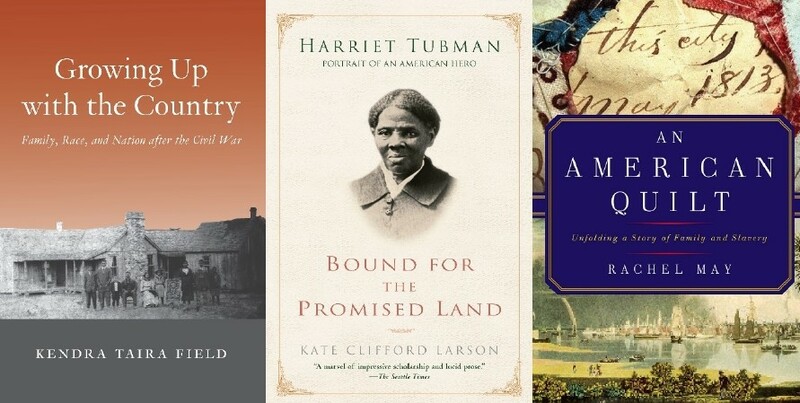 March storms postponed historian/biographer Kate Clifford Larson’s book talk about Bound for the Promised Land: Harriet Tubman, Portrait of an American Hero until October – but her lively and informative talk was worth waiting for! In early November, interdisciplinary artist Ifé Franklin offered an evocative reading from The Slave Narrative of Willie Mae, her powerful new book written in the voice of her great-grandmother. She then led a hands-on Slave Cabin Workshop in which participants worked with fabric, shells, beads, and buttons to creatively interpret miniature dwelling spaces as a way of honoring their ancestors. In late November, historian Jonathan Michael Square, founder of the digital humanities project Fashioning the Self in Slavery and Freedom, centered an engrossing talk on Brooks Brothers’ livery business, which provided garments for coachmen and footmen in the antebellum South. We are deeply grateful to historian Hasan Kwame Jeffries for making September’s Giving Voice event such a great fundraising and “friend raising” success. Professor Jeffries co-led a workshop on teaching the hard history of American slavery for local classroom teachers, then gave an inspiring talk to 100+ deeply engaged audience members. Sincere thanks to all involved. A portion of our current 4-year Cummings Foundation grant funded a thorough assessment of our two buildings’ short- and long-term restoration needs. The most pressing project was to restore rotting sections of gutter on the mansion and line them with lead to forestall future damage. 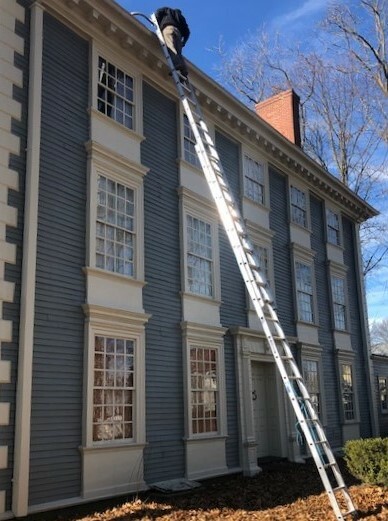 This project was completed in December, and our contractors will return in the early spring to tackle the failing gutters on the Slave Quarters. We used Cummings Foundation funds to replace a sinking 1920’s- era “ribbon” driveway with a brick and stone pad that greatly improves the view of our site from the street. We worked with the City of Medford’s Department of Public Works to repair the deteriorating wooden section of the wall between our site and the adjacent city-owned Royall Park. Finally, in 2018 we were delighted to welcome two new board members – Ariana Fiorello, the latest occupant of our Belinda Sutton Emerging Professional board seat, and Cutty Thomas, our new Assistant Treasurer – along with many new volunteers.